Below you will find a list of discussions in the Galaxy Nexus Accessories forums at the Galaxy Nexus Forum - Samsung Galaxy Nexus Community. 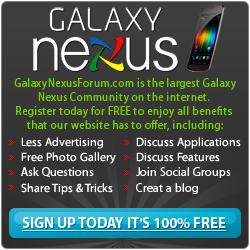 The Galaxy Nexus Accessories forum is for discussion of: Discuss the various accessories available for the Galaxy Nexus in here.. Discuss the various accessories available for the Galaxy Nexus in here. Bluetooth question: Making ringtone silent? Get that ugly VZW logo off of my Nexus! !